Bangladesh and the International Fund for Agricultural Development (IFAD) signed a loan agreement involving 92.03 million US dollars for the uplift of the vulnerable people of the rural areas as well as infrastructure and market development of six northeastern districts of Bangladesh. The deal was inked in the presence of Prime Minister Sheikh Hasina at the IFAD Headquarters in Rome, the capital of Italy on Tuesday afternoon. Economic Relations Division (ERD) Secretary Kazi Shafiqul Azam and IFAD President Gilbert F. Houngbo signed the deal on behalf of their respective sides. Finance Minister AMA Muhith, Agriculture Minister Matia Chowdhury and Foreign Minister AH Mahmood Ali, among others, were present on the occasion. Briefing reporters after the event, Foreign Secretary Md Shahidul Haque said under the agreement, a project titled 'the Promoting Resilience of the Vulnerable thru' Access to Infrastructure Improve Skills and Information (PROVATI)' will be implemented in six northeastern districts of Bangladesh. The districts are Panchagarh, Dinajpur, Nilphamari, Rangpur, Gaibandha and Jamalpur, the foreign secretary said. He added that 3.30 lakh households of these districts will be directly benefitted from the six-year (2018-2024) scheme beginning this year. Haque said of the total project cost, the IFAD will give a loan of 63.25 million US dollars and the grant is 1.25 million US dollars, while the government of Bangladesh will provide 27.09 million US dollars. The foreign secretary also said the IFAD's Governing Council Meeting that kicked off in Rome today also a "pledging session" as different countries have pledged to give money to the IFAD through this event. The IFAD uses this fund as loan and grants, he said, adding China has so far pledged the highest 90 million US dollars, while Bangladesh this year has pledged 1.5 million US dollars. Bangladesh Ambassador to Italy Abdus Sobhan Sikder, who was present at the briefing, informed the reporters that the LGRD ministry will implement the PROVATI Project. The ambassador said another project is at the negotiation stage between Bangladesh and the IFAD. The project involving US Dollars 118 million is supposed to implemented by the Agriculture Ministry in different districts of southern Bangladesh, he said. "The deal was not signed today as there is a need to address some issues through discussion," Sikder said. "We hope that the scheme to be implemented by the Agriculture Ministry will be signed soon," he said, adding that IFAD is going to finance the two biggest projects in the agriculture sector of Bangladesh. Such big projects, he said, were not implemented in the agriculture sector in the past. The foreign secretary said the IFAD gives loan at a concessional rate of less than one percent. He said earlier the IFAD president paid a courtesy call on Prime Minister Sheikh Hasina at the IFAD Headquarters. Haque said the Rohingya issue also came for discussion among other matters. He said the IFAD president has an attachment with Bangladesh and a clear idea about the country and its development as he visited Bangladesh twice. 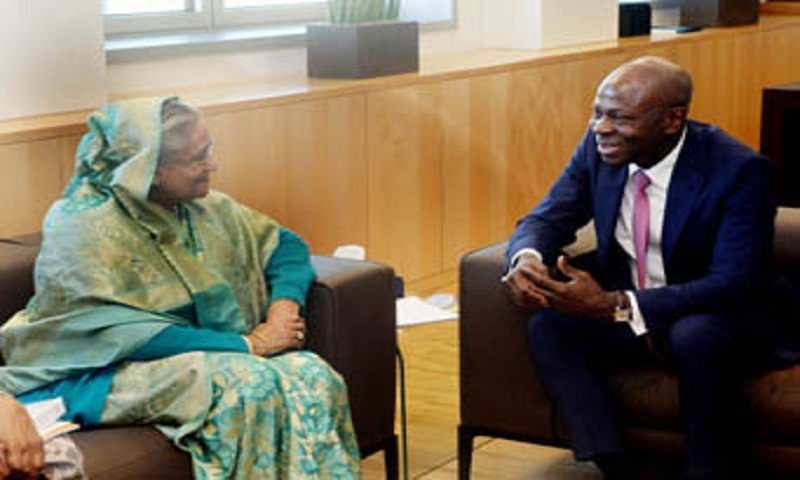 "IFAD President Houngbo told the prime minister about the development of Bangladesh and its potentiality repeatedly and highly appreciated her leadership," the foreign secretary said. PM's Additional Press Secretary Md Nazrul Islam was also present at the press briefing.